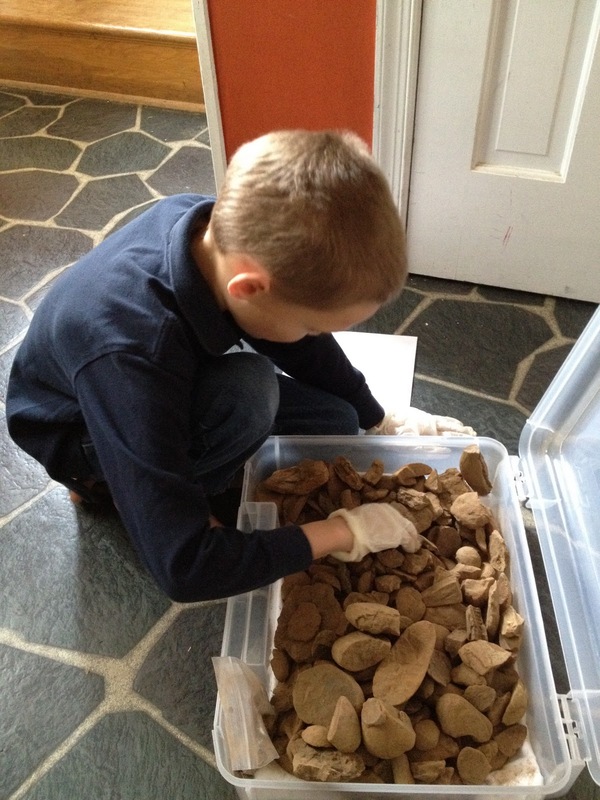 Very dirty Mazon Creek fossils for Xmas! A subscription to Deposits magazine. This issue: The Geology and Terrestrial Life of the Carboniferous. Conodonts were bizarre, fish-like probable chordates that may have resembled modern lampreys. They first evolved in the Cambrian, or possibly even the Precambrian, and died out in the Triassic-Jurassic extinction. Conodonts were eel-shaped in form and most had large eyes, at least in comparison to the body. They had various toothy blades in the mouth to form what is known as "the conodont apparatus," which vaguely resembles the radula of a snail or slug. Conodonts were probably capable of maintaining a cruising speed, but could not perform bursts of speed because their eel-like form would probably get them all tangled up. They would then be easy prey for any kind of predator trying to eat them. They probably swam in about the same style as an eel or loach. Although they had sharp teeth, they probably were not predators. Instead, they supposedly used "the conodont apparatus" as a sort of baleen to filter plankton from the water. The largest conodont that has been found so far is Promissum, which reached lengths of 16 inches. Specimens of Promissum can be found in the Soom Shale of South Africa. Unlike most conodonts, Promissum had smaller eyes relative to body size. Promissum was about as long as an average house cat's body, without the head or tail. 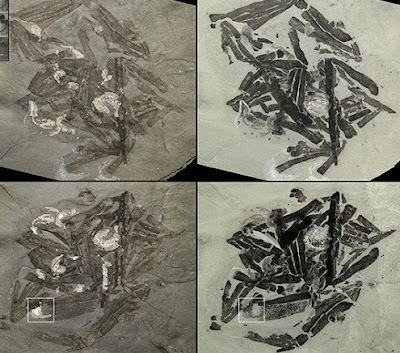 The fist conodont specimens found were its individual toothy bars known as "conodont elements." Thanks to generous contributions from readers and various friends of the blog, Art is 20% closer to reaching the Field Museum for his 8th birthday. The museum has generously offered free admission and a special tour, including the possibility of a peek behind the scenes with a fossil dude. Sincere thanks to everybody who is helping to make this trip a reality for Art. Titanichthys was a giant Devonian placoderm which was about twenty feet long. Since the tooth-like gnathal plates in its mouth were small and dull, it is believed that this fish fed on tiny zooplankton and tiny fish. Fossils have been found in North America, Morocco, and Poland. Some specimens are found in the Cleveland Shale of Ohio, and shared the same area with Cladoselache, Dunkleosteus, and many other strange fish. 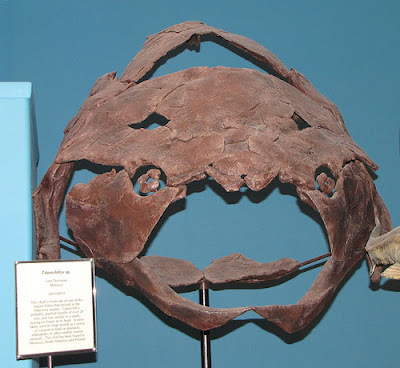 The fossil below shows the upper part of a Titanichthys skull. Although it doesn't look like it, it's a well-preserved specimen. The only downsides are that it does not preserve the bottom half of the skull, and it was flattened during fossilization. But what's amazing is that it's complete to a certain extent. The front of the skull is facing upwards, while the neck plates in the back of the skull are facing downwards. Also note the strange diamond-shaped hole in the middle of the skull. This is the neck joint that gave these so-called arthrodire placoderms their name. "Arthrodire" means "jointed neck." Titanichthys was one of the largest placoderms. In fact, it was the second largest, after Dunkleosteus terrelli. When Titanichthys was first discovered, some scientists thought that the pieces of bone were from a dinosaur. But after more study, it was discovered that they were actually from a placoderm fish. Royal Ontario Museum Burgess Shale Fossil Gallery. I first found The Royal Ontario Museum Burgess Shale Fossil Gallery before it was even finished being made, because I'm always using the internet to research fossils. The Royal Ontario Museum had to keep people from going to the website for a while because they were not done with it. But now they are done and it is amazing. I love that this fossil gallery tells you maximum size, supposed diet, abundance, classification, and morphology. It also has pictures of fossils, drawings, and even some videos. You can zoom in on the fossils and drawings to see them up close. At first it seems blurry, but then it clears and you can see amazing details. The Royal Ontario Museum Burgess Shale Fossil Gallery is the best place to find information and pictures of Burgess Shale fossils. The Gallery even features fossils that were discovered last year, in 2010. One of the most notably strange animals in the Burgess Shale that is featured in the ROM Fossil Gallery is Herpetogaster collinsi, which is weird. It had a flexible and extendible stalk, with a disc to anchor it to sponges. It had a sea cucumber-shaped body on top of the stalk. The body had thirteen segments, a circular mouth on top, and two branching tentacles on top of the head on either side of the mouth. Its maximum length was 48 mm. One amazing specimen of Herpetogaster collinsi shows many individual specimens attached to a single Vauxia gracilenta sponge. Another amazing animal in the ROM Fossil Gallery is Odontogriphus omalus. 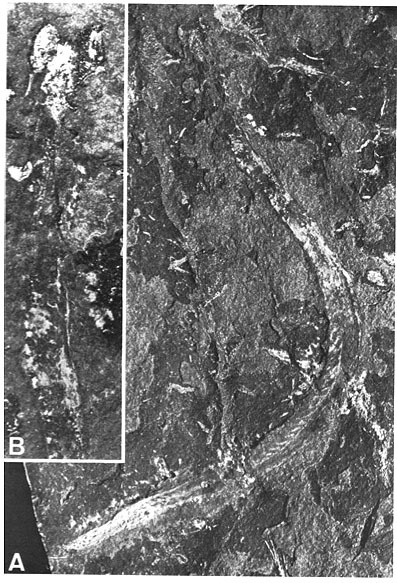 The fossil shown below preserves Odontogriphus grazing on mats of the cyanobacteria Morania. Odontogriphus omalus was an early slug-like mollusk, related to the more heavily armored Wiwaxia. A strange ctenophore that is featured in the ROM Fossil Gallery is Xanioascus canadensis. It looked like a balloon with eggs inside of it. 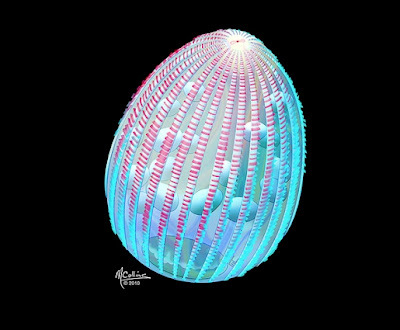 It also had twenty-four comb rows, which are the rows of cilia that propel a ctenophore through the water. Modern ctenophores only have eight comb rows. 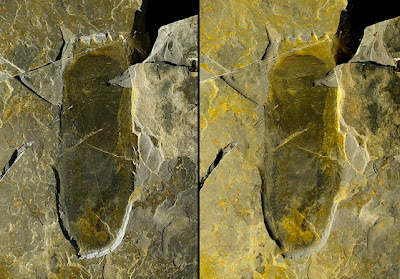 Fossils of X. canadensis are usually found torn, suggesting that these ctenophores were very fragile and could be easily torn. One of the coolest things about the ROM Fossil Gallery is that they feature some very obscure animals and show a lot of information that most people cannot find anywhere else on the internet. 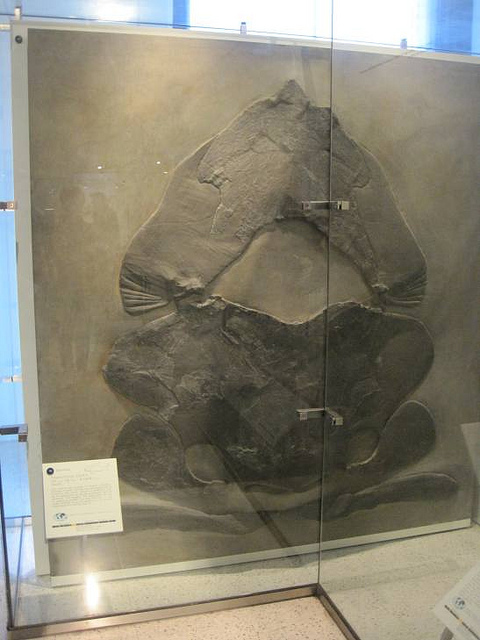 Xanioascus canadensis is one of the very obscure creatures in the ROM Fossil Gallery. I recommend that anyone searching for obscure Burgess Shale animals, or even non-obscure Burgess Shale animals, should go to the ROM Fossil Gallery. They have a lot of information, even the meaning of the names, which is something that I love to know. This Gallery has a wide range of Burgess Shale life, even cyanobacteria and algae. In my opinion, it's the best place to find information on Burgess Shale fossils. 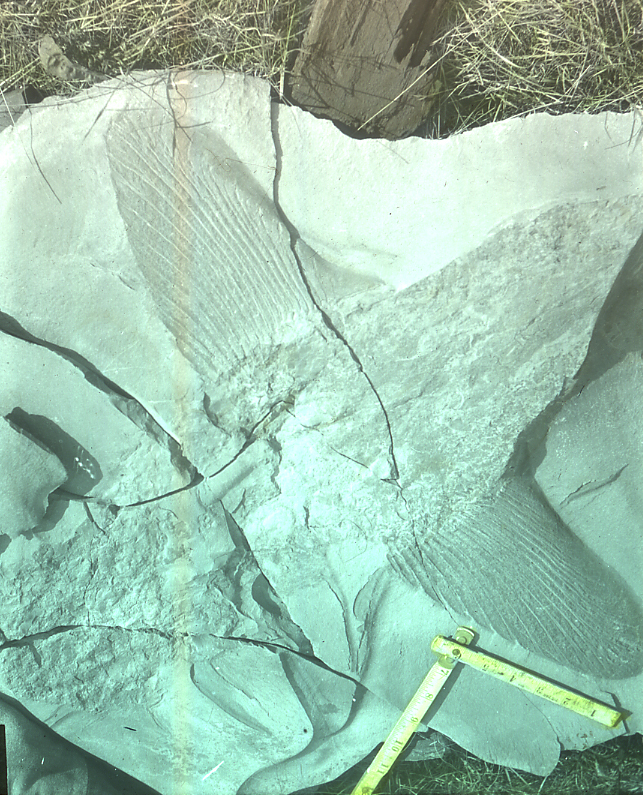 "Materials for this virtual exhibit – called 'The Burgess Shale' – were produced and/or compiled by Parks Canada (for the Parks Canada section) and the Royal Ontario Museum (for all other sections) for the Canadian Heritage Information Network (Virtual Museum of Canada program) for the purposes of providing the public with information about the Burgess Shale."